Later it emerged that Montoya was not slowing down because he wanted to, but rather because BMW telemetry was showing that there was a problem with his engine and Monty was advised to back off on the revs, which is not what he wanted to do with Raikkonen right behind him. But he managed to stay and at the end he grabbed a little piece of history, becoming only the second man in the history of the sport to win the Indianapolis 500 and the Monaco Grand Prix. Would Michael have won if Trulli had not been there? It is one of life's imponderables but what was clear was that whatever happened Michael was not enamoured by his Bridgestone tires. "There was nothing wrong with the car," said Michael, condemning by omission if nothing else. In motor racing it does not matter what might have been because it is the man who stands on top step of the podium who is the only man that matters and that privilege belonged to Montoya. 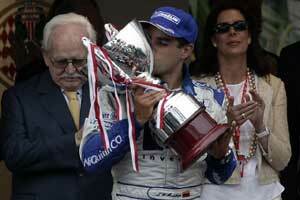 But let us not forget Williams for the team has often seemed to be condemned to fail on the streets of Monaco. Despite the dominant cars of the late 1980s and the early 1990s, Williams had not won the Monaco Grand Prix since Keke Rosberg's tour de force in 1983, twenty years ago. The jinx has been beaten. And with it too has gone some of the team's immediate problems - particularly pressure from BMW over the performance of the chassis. All year long the denizens of Munich have been banging on and on about the shortcomings of the Williams and now they have lost some of their teeth. There was not much wrong with the Williams chassis on Sunday. The big disappointment was Ralf Schumacher, the pole position man who led the early laps. Ralf's strategy was to pit on the 21st lap. He dropped to the back of the leading eight runners - no-one else was really in the picture at all. By the time the first round of pits stops was over Ralf was back in fourth place and was stuck behind his brother for more than 15 laps, never looking likely to overtake. Ralf complained that the car was not handling as well on its second set of tires. The second pit stop sequence did not change anything and Ralf was even able to have an off at Rascasse, which cost him time but not a position. He finished fourth. The result was a source of great satisfaction for the team: 15 points from one weekend moves the team back to third in the Constructors' Championship, eight clear of Renault and within striking distance of Ferrari and McLaren. It will be a haul to close the gap but the combination is getting better and better, as the team said it would be. Raikkonen reckoned that he might have been able to sneak the victory had it not been for traffic in the laps after Montoya stopped for the first time. It was only a couple of laps but Kimi had to get around the rather slow moving Toyota of Olivier Panis and it cost him some time. Raikkonen's biggest problem however was probably his start which allowed Montoya to get ahead at the start. It is also worth noting that the team changed a valve on his engine in parc ferme (again) although there was no sign that he had to keep his revs down as happened in Austria. David Coulthard's hopes of achieving a lot from sixth on the grid were spoiled by the fast-starting Alonso who was in his way all the way to the first stops. David got ahead of him at the first stops but then found himself held up by Jarno Trulli and this was so bad that at the second stops Alonso managed to get of both of them. The two men found at the second stop that they were on exactly the same strategy and as Coulthard went away from his pit Trulli popped out in front of him. "Considering the speed of my car and our strategy I would have had the chance to gain a much better position," he said. David finished seventh. If nothing else however McLaren left Monaco having moved back ahead in the Constructors Championship. Down at Ferrari they seemed a little glum. "I could say that I might have been able to finish higher if I had not been stuck behind Trulli in the early stages," said Michael, "but our strategy was to go for a long first stint and that meant having more fuel, which is why I was behind him. At some points in the race I was not able to push as hard as I would have liked." Barrichello's day was even glummer. "Whenever I was able to push hard I had traffic," Rubens said. "I never managed to get the best out of the car." The two Renaults made their usual rapid starts but Trulli was blocked by Raikkonen and so remained fourth. Alonso however jumped ahead of both Barrichello and Coulthard. After that there was not much to report as Trulli spent the first stint with Michael Schumacher stuck behind him and after that had David Coulthard holed up in his wake. The pace was such that Alonso was able to pass the pair of them to finish fifth, which from eighth on the grid was a good achievement. Trulli's fourth to sixth was less of an achievement. Remarkably Jarno blamed traffic which was odd because for most of the time he was the traffic! The four big teams completely dominated the event and the gap back to the rest was quite frightening. Everyone else was lapped by the end. In the early laps Mark Webber led the chase but it did not last long for the Jaguar engine lost its air pressure and Mark had to pit for some more air. The problem repeated itself and it was pointless to go on. Pizzonia did not even get that far, pulling off at the chicane after 11 laps because of an electrical problem. The disappearance of Webber made da Matta the chief chaser in the early laps but he dropped behind Villeneuve's BAR at the first stops. "I was out there pretty much on my own for the 78 laps," he said. "Finishing ninth behind the top four teams is a reasonable result." Olivier Panis's awful weekend continued with his car way off the pace. But being the trooper that he is Olivier was there at the end albeit four laps down. His comments are best kept as a secret. Villeneuve's race had come to an end prematurely with his BAR's rear end flaming in a colorful fashion. It was an engine failure. "It was extremely frustrating that I was not able to finish the race again," said Villeneuve. This meant that Fisichella was able to finish 10th and with Firman 12th the team was at least reliable. But not very competitive. "I expected to score some points," said Fisichella, "but for most of the race we were not quick." "The car was good on new tires but when they were older the grip was low." The Bridgestone issue also hurt Sauber although Frentzen's race ended with a decent sized crash on the first lap when he clipped a curb at the exit of the Swimming Pool and went straight into the barrier on the outside of the corner. "I live here," said Heinz, "and I am going to be annoyed at myself every time I pass this place." Heidfeld had no such trouble but tire performance meant that 11th was the best he could do. Minardi's race ended with fuel vaporization problems stopping both cars early on.